What kind of columns you use depends on your existing workflow, type of work, and the structure of your team. It’s best to keep it simple, but you do have more control and cover more scenarios with more columns. Here are some suggestions, depending on the type of work you do. RESEARCH — gather the problems and requirements you need to solve. UX — work on converting those requirements to a concrete wireframe or a sketch. REVIEW — the client is responsible to give you early feedback on the design. IMPLEMENTATION — once you have a prototype, you can start coding or creating a mockup. FINAL REVIEW — the client does one last review to decide whether the work goes to DONE or back to IMPLEMENTATION, and you can now issue an invoice for the task. DONE — useful for the client to see everything that’s finished. PERSONAL BACKLOG — you can store errands and personal appointments here so they don’t get mixed with work. WORK BACKLOG — everything that needs to be done starts here. THIS WEEK — you make a selection of what you’ll work on during the week from your backlog, so you have a rough plan what you can accomplish and when. TODAY — everything you need to do on that day, once you wake up (you can move tasks to this column the day before). DOING — tasks that are in progress right now (good for collaboration as others can see what you’re working on). ON HOLD — things that are not completed because you’re waiting for the input or response, like a client sending you some file or paying an invoice. DONE — you can also just mark the task as completed so it doesn’t create clutter. 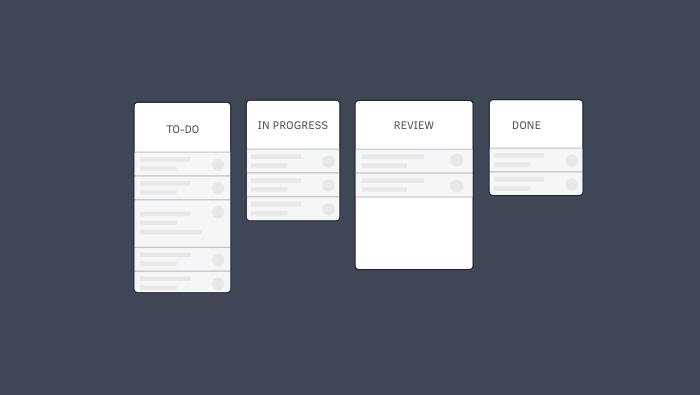 BACKLOG — all the user stories, bugs, requests, and improvements start here. The product manager talks to the client, collects their requests and adds priorities and labels. Later, developers can assign themselves to a task from the top of the priority list. NEXT — this is a selection of tasks for the next sprint. SPRINT — this column has a start and end date, and all the tasks should be completed by the sprint’s end date. If not, they’re given top priority in the next one. IN DEVELOPMENT — lists all the tasks currently in progress, as well as tasks that got returned from QA. QA — work that needs to be tested before it can be released. If it needs more work, it goes back to IN DEVELOPMENT. CODE REVIEW — once a task passes testing, it’s good practice to have someone else go through the code. DOCUMENTATION — all the work needs to be documented and communicated with the client before it can be released. RELEASE — finished tasks end up here and can be marked as completed after the sprint is over. ActiveCollab has Column view, which makes it perfect for agile workflows like Kanban and Scrum. For more tips about Kanban and agile project management, download our free Kanban ebook or try out ActiveCollab for free.